Reinhold Joest and Joest Racing have partnered with Mazda for a run at the 2018 IMSA prototype title. IRVINE, Calif. – Reinhold Joest is a soft-spoken man who shuns the spotlight and rarely grants interviews. But there’s no avoiding the spotlight that has shone on the race team he founded, Joest Racing, since they partnered with Mazda to do battle on U.S. soil in next year’s IMSA WeatherTech SportsCar Championship. The team will compete as Mazda Team Joest in the WeatherTech Championship in 2018, with the Mazda RT24-P prototype racing under Daytona Prototype international (DPi) rules. 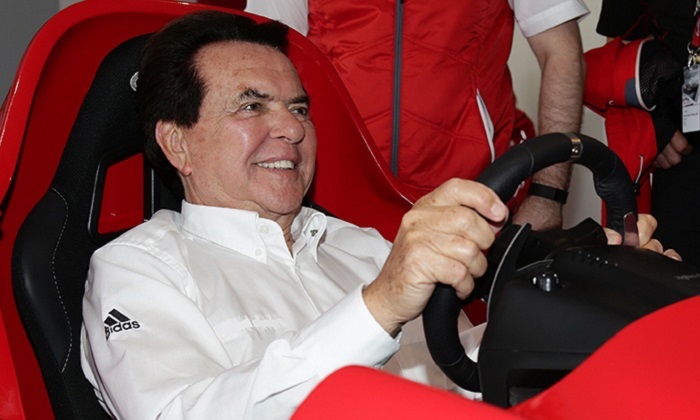 Joest created the team in 1978 after a highly successful driving career that began in 1962. His team has achieved an unmatched record of endurance racing championships and Le Mans race wins. After stints as the factory team for Porsche and Opel, Joest dominated the sport as the factory Audi team since 1999. Audi abruptly withdrew from endurance racing at the end of the 2016 season, primarily due to troubles for parent company Volkswagen. With the crushing disappointment of the unexpected bombshell, Joest committed to go all-out in the final races to close the chapter properly. The end of that era led to the start of a new one with Mazda, but only after deep consideration. Within weeks, the team received offers, but Joest didn’t feel comfortable with them despite large sums of money being proffered. At the last moment, it was decided that Joest team director Ralf Jüttner would make a trip to Daytona for the 2017 Rolex 24. As Jüttner sat in a corporate hospitality area on the morning of the 24-hour race, he was approached about taking a meeting with Mazda Motorsports executives John Doonan and Jim Bowie, who were looking to align with a top team in 2018. While the pre-race ceremonies took place, the trio met in secret. As a sign of deep loyalty and confidence, Joest had retained a high percentage of employees, despite not racing in 2017. Even some who did depart, such as engineer Jason Taylor (who joined Ed Carpenter Racing in the Verizon IndyCar Series), have returned to reassume their key roles with Mazda Team Joest. Mazda Team Joest has begun testing for the 2018 season, which kicks off with the Rolex 24 at Daytona in late January. The team will soon have new U.S. headquarters in the Atlanta area, and has an aggressive schedule of off-season testing to develop an improved Mazda chassis. Joest promises that his team’s meticulous preparation and unrelenting drive will continue with the Mazda RT24-P prototype.